"I believe that poverty is not the lack of material, but the lack of imagination to create." is a Queens, New York-based fashion designer. She is of Haitian descent and holds the love for her parents’ home in high regards when designing. Her Caribbean roots have helped her to remain colorful and sustainable as she sticks to Haitian ideals of sustaining the community and developing economies, globally. With her love for Ankara prints, bold colors, and earth tones she manages to create pieces for consumers that coincide with her brand’s goal of environmentally friendly practices. There is a strong need for innovation, sustainability, and ethics within the fashion industry and she works to design trendy pieces that will bring awareness of sustainability to developing communities via marketing the Reduce-Reuse-Recycle framework, circular economy, and use of trendy fabric tones (Pantone) that are sustainable (minimal chemicals and/or natural dyes). Her pieces are designed using fabrics made from 50% + recycled plastic bottles, organic cotton blends and Ankara fabric. This past year she had the opportunity to travel to Haiti and facilitate 2 Fashion management workshops during TechStars, Port-au-Prince Start-Up Week. She was also a guest speaker for a few design courses at the Fashion Institute of Technology, the New York School of Design and Pratt Institute. She has worked with the New York Public Library and facilitated a lecture for their “Art Recycled” workshop alongside designer Ruth Marshall. She is an active mentor working with a Fashion Design student from Drexel University via a Philadelphia based non-profit organization; The I Am Project. This year she was featured on NBC 10 Philadelphia for her work as a mentor. Naika has been featured in several published works including a Doctor of Philosophy Graduate Dissertation; Black fashion designers matter. ”A qualitative study exploring the experiences of Black female fashion design entrepreneurs”, submitted by Iowa State University alumni, Sami Kennedy Benson. So why the name Jacques Louis? The clothing line is named after her deceased father Jacques Louis Colas. The loss of her father and watching her immigrant single mother struggle while growing up, became the driving force behind her love for the arts and community. 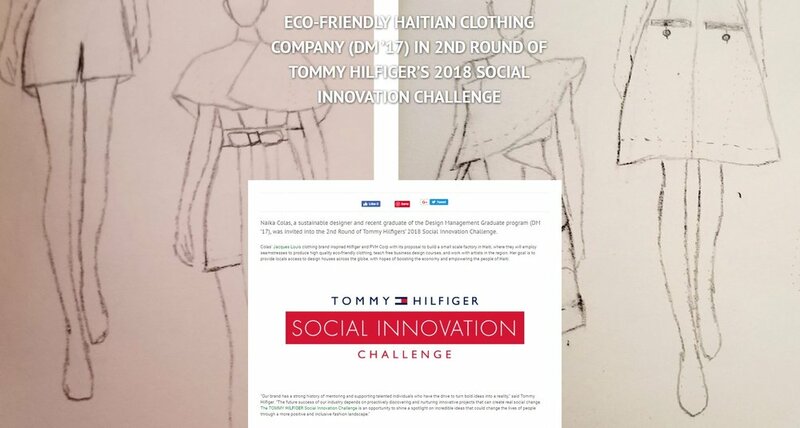 This past September, Jacques Louis made it to the 2nd round of Tommy Hilfiger’s Social Innovation Challenge. During the process of the Social Innovation Challenge, she acted as a mentor for fourteen Impact Hub member’s and Fashion Designers based in Port-au-Prince, Haiti. Her hope is to change the mindset of developing communities and their focus on sustainable living practices by designing creative pieces and projects that will unify low-to-high income communities to work together on building a better world. This project was funded by Pratt Institute’s Graduate Student Engagement Fund.